Whoever would dial the telephone number 274-1490 in Phoenix and listened to the answering machine, would hear the harsh reply: "We're not here, but if you leave a number, maybe we'll call you back!" So much for the friendly part of Ben McAvoy. If you wanted to talk with Ben about the Starfighter, you could be sure, you'd get a callback. All other things were not so important. His life was consumed by the F-104 Starfighter, whose 50th anniversary he only survived by a few weeks. As a real highlight, on 13 March 2004, Ben had the honor, on the 50th Anniversary of the F-104 Flight Test Reunion in the Lancaster Elks club in Palmdale, California, to speak on the highlights of the world-wide operations of the Starfighter. He gave stories of business, bureaucracy, admiration and technical problems of his love. An airplane of which over 2500 were built over the years and flown with love and enthusiasm. And Ben was there, from its beginning in Palmdale until 1981 as Lockheed's representative assigned with the German training program at Luke AFB. In nearly thirty years as Lockheed technical advisor, Ben McAvoy helped service all models of the Starfighter and watched with attention. From the first airplanes of the A series, to the F-104C's in combat in Viet Nam, to the F and G models of the Military Assistance Program (MAP) and to the 916 Starfighters for Luftwaffe and Marine, Ben was there. Ben McAvoy was born in 1932 in Iowa, Kansas, a town in the middle west of the USA. After high school, He enlisted in the USAF. 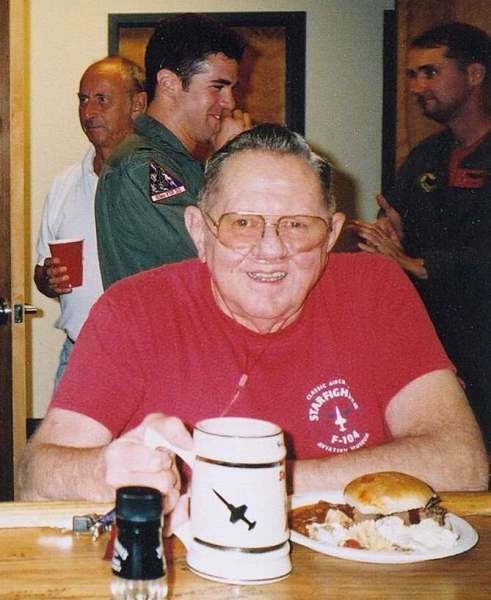 His goal was to become an aircraft mechanic on the legendary P-51 Mustang fighter. During his time in the Air Force, he became a technician on the F-86 and after four years of service he came to the decision: Jet Fighters! When Ben signed up with Lockheed in 1956, the secret Starfighter program was in its final stage of development. Lockheed's legendary airplane engineer, Kelly Johnson, had filtered out two basic demands for the future American air superiority fighter from the experiences of the pilots of the Korean War: Speed and acceleration. When he presented the XF-104 to the first test pilot Tony LeVier in 1954, the experienced pilot only had one question: "Where are the wings?" However the test flights proved that Kelly Johnson had succeeded in developing an airplane, which could reach more than twice the speed of sound in horizontal flight, at altitudes of over 100.000 feet, and in less time than every other aircraft in the whole world. Ben had found his life's-task. Technical support of the Starfighter. After his training in Palmdale, Ben's first assignment was as aircraft mechanic at Eglin AFB, Florida and Duluth, Minnesota. In 1958 he participated in the promotional tour of the new US fighter to several European countries including the World Exhibition in Brussels and took care of "his" Starfighter. As a result, Ben was promoted to Lockheed Field Representative for the Starfighter and assisted in the F-104 set-up in Spain and in the Federal Republic of Germany. In 1961 Lockheed sent their Starfighter expert to Nörvenich AB, where the Luftwaffe was beginning its first training program with the new combat aircraft. Ben advised the mechanics about the refinements of the new starfighter and got, beside admiration, some critics as well, because of his superior system knowledge. The intelligent pilots appreciated it and were grateful when they had landed somewhere and after a telephone call with Ben in Nörvenich, the 104s were ready to fly again with just a few tricks. Every now and then Ben was also used as flying mechanic, in order to solve problems on the spot. He could hardly hide from the question: "What did you do with my airplane?" As a civilian worker Ben showed little shyness at ranks and military position. After a problem was solved, a lot of pilots were advised "to take better care better of Ben's airplane in the future". 1964 Ben returned to George AFB, Ca. In short order he was moved again with the F-104 C's to DaNang AB South Vietnam, in order to provide technical assistance for the first combat missions of the Starfighter. As he did in Nörvenich Germany, Ben became the central point of contact relating to the systems of the F-104. Throughout the employment the Starfighter in Vietnam, it was occasionally evaluated critically, even though the numbers stated something else. Over 10,000 missions with a combat ready rate of over 80%. Acknowledged positively by the escorted combat aircraft and also by Forward Air Controllers, who needed the speed, the F104 supplied fighter-bomber fire support to the constantly changing fighting in air-to-surface employment. Although the Starfighter did not book a single air victory, it would fulfill its task of air superiority. The MiGs preferred, in order to avoid the Starfighter, to stay out of its way. 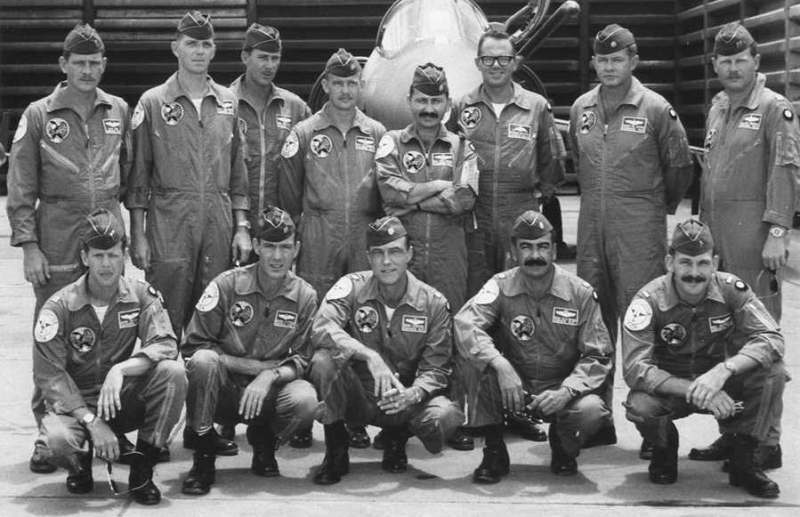 After the end of the initial employment of the F 104 in Vietnam, in 1966 the Starfighters were again sent to Southeast Asia. At the end of 1966 a squadron was sent to Udorn Thailand, and of course with Ben McAvoy as Lockheed Field Service Representative. With the experiences of the combat operations Ben returned in 1967 to the USA and became technical advisor for the F-104C and D in San Juan Puerto Rico. Then in 1969 his employer Lockheed put him in charge of maintenance activities of the German-American training program for the Starfighter at Luke AFB, Arizona. With a short interruption, 1972 - 1973, when Ben supported the build up of the Greek Air Force in Athens, Ben was "Mr. Starfighter" for the program at Luke. Until 1981 he cared for the German F-104 G Starfighters at Luke as Lockheeds Tech Rep. For a total of 10 years he became part of the most successful binational training program, the German Air Force and the German Navy had ever accomplished. Whenever questions were asked about the Starfighter, from night bombing to Dart Tow, Ben was the first one to be asked. His knowledge of the airplane and its abilities brought not the question whether a certain profile was feasible, but how it had to be flown. Ben knew about the potential of "his" Starfighter. But not only were the big decisions given to Ben, every now and then it paid off for changing military commanders to have a man on hand with Bens expertise. Ben thought it was necessary after 10 years of flying operations at Luke, to remind the flyers by writing about the "Operating characteristics of the F/TF 104 / J-79 during high ambient temperatures". Would "T2 Reset" still be a secret? Ben became acquainted with the Germans, and therefore the respect grew. They were German airplanes, but somehow all were Ben's own children, for whom he felt fully responsible. Even after years of thundering start and engine whistles on the approach Ben had a reason to look into the sky, in order to follow his Starfighter. In 1981 Lockheed sent Ben back again to the Skunkworks in Palmdale Ca. His expertise was again needed for another secret project of the USAF, the F-117 Nighthawk fighter. Sadly Ben left his beloved Starfighter and contributed to the operational success of the F-117. In 1987 Ben McAvoy retired after 31 years with Lockheed. He could now devote himself totally again to his Starfighter. As technical advisor, this time freelance, he gave his advice and actively helped to make old Starfighters airworthy again, and worked to keep the few flying ones still airworthy. In 1976 Ben helped Daryl Greenamyer successfully establish a new low-altitude flight speed record of 988 miles per hour with his privately built F-104. Ben also advised museums and helped owners of private Starfighters on how to maintain their aircraft. Of the 50 years of the F-104 Starfighter Ben McAvoy enjoyed 48 years. Therefore it was never a question for him to be a member of the Starfighter organization, the Cactus Starfighter Squadron. Although only in the rear seat, at least that's what is known, Ben collected sufficient flying hours, to take center stage after night flights and at the bar. Kelly Johnson, who conceived and designed the Starfighter in 1953, once said. "Ben McAvoy knows more about the F-104 Starfighter than I do." Well said. Ben McAvoy passed away on 14. May 2004. On 12.June 2004 a funeral service was held in his house with friends, acquaintances and the Cactus Starfighter Squadron. His ashes were scattered into the wind on 18.July 2004 over Cold Lake, Canada. From an F-104 Starfighter of course. Wer in Phoenix die Nummer 274-1490 anwählte und auf den Anrufbeantworter stieß, konnte die barsche Mitteilung hören: "Wir sind nicht hier, und wenn Sie eine Nummer hinterlassen, rufen wir vielleicht zurück!" Soviel zum freundlichen Teil von Ben McAvoy. Wer mit ihm über den Starfighter reden wollte, konnte sicher sein, einen Rückruf zu bekommen. Alle anderen waren nicht so wichtig. Sein Leben galt der F-104, dem Starfighter, dessen 50-jähriges Jubiläum er nur um Wochen überlebt hat. Noch am 13 März 2004 hatte Ben anlässlich der 50-jährigen F-104 Flight Test Reunion im Lancester Elks Club in Palmdale, Kalifornien, die ehrenvolle Aufgabe, die Höhepunkte aus dem weltweiten Einsatz der Starfighter vorzustellen. Geschichten von Geschäften, Bürokratie, Bewunderung und technischen Problemen eines Flugzeugs, von dem in all den Jahren über 2500 Stück gebaut und mit Liebe und Begeisterung geflogen worden sind. Und Ben war dabei, von Palmdale bis 1981 als Lockheed's Mann bei dem Deutschen Ausbildungsprogramms in Luke AFB. In fast dreißig Jahren als Lockheeds Technischer Berater hat Ben McAvoy alle Starfighter gesehen und mit Aufmerksamkeit verfolgt. 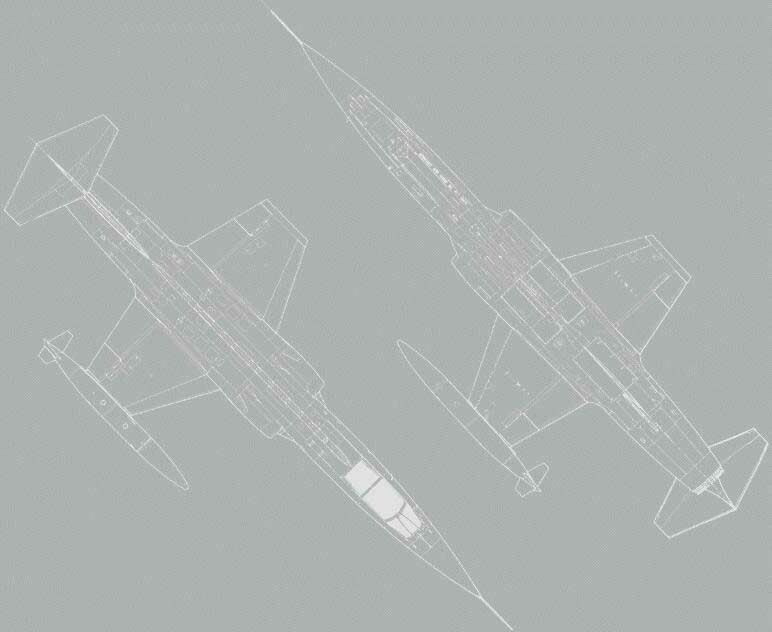 Von den ersten Flugzeugen der A-Serie, über die F-104Cs im Kampfeinsatz in Vietnam, bis zu den F- und G-Modellen des Military Assistance Program (MAP) und den 916 Starfightern für die Deutsche Luftwaffe und Marine. Ben McAvoy, geboren 1932 in Iowa, Kansas, einer Kleinstadt im Mittleren Westen der USA, meldete sich nach der Schule zum Dienst in der neuen USAF. Sein Ziel: Mechaniker an dem legendären P-51 Mustang Jäger. Noch während seiner Militärzeit wurde er Techniker für die F-86 und nach vier Jahren stand sein Entschluss fest: Jet Fighters! Als Ben 1956 bei Lockheed anheuerte, war das geheime Starfighter Program gerade am Abschluss der Entwicklungsphase. Lockheeds legendärer Flugzeugingenieur Kelly Johnson hatte aus den Erfahrungen der Piloten des Koreakrieges zwei Grundforderungen für den zukünftigen amerikanischen Luftüberlegenheitsjäger herausgefiltert: Geschwindigkeit und Beschleunigung, und was er dem ersten Testpiloten Tony LeVier 1954 mit der XF- 104 vorstellte, entlockte bei dem erfahrenen Piloten nur die Frage: "Und wo sind die Tragflächen?" Die Testflüge bestätigten jedoch, daß es Kelly Johnson gelungen war, ein Flugzeug zu entwickeln, das mehr als doppelte Schallgeschwindigkeit im Horizontalflug erreichen konnte, in eine Höhe von über 100.000 Fuß vorstoßen konnte, und das in weniger Zeit als jedes andere Fluggerät auf der ganzen Welt. Ben hatte seine Lebensaufgabe gefunden. Technische Betreuung des Starfighters. Nach seiner Ausbildung in Palmdale wurde Ben zunächst als Mechaniker in Eglin AFB, Florida, und Duluth, Minnesota, eingesetzt. 1958 nahm er an der Vorstellungsreise des neuen US-Jägers in mehreren europäischen Ländern teil und betreute "seine" beiden Starfighter bei der Weltausstellung in Brüssel. Inzwischen war Ben zum Lockheed Field Representative für den Starfighter befördert worden und begleitete die Aufstellung von Verbänden in Spanien und in der Bundesrepublik Deutschland. 1961 schickte Lockheed seinen Starfighterexperten nach Nörvenich, wo die Luftwaffe ihre ersten Ausbildungsprogramme mit dem neuen Kampfflugzeug durchführte. Ben beriet die Warte und Mechaniker über die Feinheiten des neuen Wundervogels und schaffte sich neben Bewunderern auch einige Kritiker unter den Piloten, denen er in Systemkenntnissen haushoch überlegen war. Die Klugen wussten das zu schätzen und waren dankbar, wenn sie mit ihrem Flieger irgendwo gelandet waren, und ein Telefongespräch mit Ben in Nörvenich den Flieger mit ein paar Handgriffen wieder flugklar machten. Mitunter wurde Ben auch als fliegender Mechaniker eingesetzt, um unbekannte Probleme vor Ort zu lösen. Dabei konnte er die Frage kaum verheimlichen: "Was hast du mit meinem Flugzeug gemacht?" Als ziviler Mitarbeiter zeigte Ben da wenig Scheu vor Dienstgrad und Rang. Und wenn das Problem behoben war, wurde mancher Pilot mit dem Hinweis bedacht, "in der Zukunft besser auf Ben's Flugzeug aufzupassen". 1964 kehrte Ben in die USA zurück, und nach kurzer Vorbereitungszeit wurde er mit einer Staffel F-104 C nach DaNang, Vietnam, versetzt, um die ersten Kampfeinsätze des Starfighters technisch zu betreuen. Wie bereits in Nörvenich wurde Ben zur zentralen Steuerstelle, wenn es um die Technik der F-104 ging. Obwohl der Einsatz der Starfighter im Vietnamkrieg mitunter kritisch bewertet wird, sprechen die Zahlen doch eine andere Sprache. Über 10.000 Einsätze mit einer Klarstandsrate von über 80% brachten Anerkennung von den eskortierten Kampfflugzeugen und auch den FAC's, die die Geschwindigkeit brauchten, mit der die nun im Luft-Boden Einsatz kämpfenden F104 Jagdbomber Feuerunterstützung an die ständig wechselnde Front bringen konnten. Obwohl die Starfighter nicht einen einzigen Luftsieg verbuchen konnten, erfüllten sie ihren Auftrag von Luftüberlegenheit. Die MiGs zogen es vor, die Starfighter zu meiden, und gingen ihnen aus dem Weg. Nach dem Ende des Ersteinsatzes der F 104 in Vietnam 1966 wurden die Starfighter noch einmal nach Südostasien geschickt. Ende 1966 wurde eine Staffel nach Udorn in Thailand verlegt, und mit dabei natürlich Ben McAvoy als Lockheed Field Service Representative. Mit den Erfahrungen im Kampfeinsatz kehrte Ben 1967 in die USA zurück und wurde postwendend Technischer Berater für F104 C und D in San Juan in Puerto Rico, bevor sein Arbeitgeber Lockheed ihn 1969 an die Front des Deutsch-Amerikanischen Ausbildungsprogramms für den Starfighter in Luke AFB, Arizona, beorderte. Mit einer kurzen Unterbrechung von 1972 - 1973 in der Ben den Aufbau der Griechischen Luftwaffe in Athen unterstützte, war Ben Mr. Starfighter für das Programm in Luke. Bis 1981 betreute er als Lockheed TechRep 10 Jahre lang die deutschen F-104 G Starfighter in Luke und wurde so Teil des erfolgreichsten binationalen Ausbildungsprogramms, das die Luftwaffe und die deutsche fliegende Marine seit Bestehen der Bundeswehr durchgeführt hatten. Wann immer Fragen zum Einsatz der Starfighter auf den Tisch kamen, vom Nachtbombeneinsatz bis zum Dart-Tow, wurde Ben zur ersten Prüfstation. Dabei war seine Kenntnis des Flugzeuges und seiner Fähigkeiten nicht die Antwort ob ein gewisses Profil machbar sei, sondern, wie es geflogen werden müsste. Ben verstand das Potential "seiner" Starfighter, wenn man es nur richtig machte. Doch nicht nur die großen Entscheidungen liefen über seinen Tisch. Mitunter zahlte es sich eben aus, daß den wechselnden Militärs ein ständiger Experte zur Verfügung stand, der nach 10 Jahren Flugbetrieb in Luke es wieder einmal für notwendig erachtete, die Flieger schriftlich auf die "Operating characteristics of F/TF 104 / J-79 during periods of high ambient temperatures" hinzuweisen. Als ob T2 Reset ein Geheimnis wäre. Ben lernte die Deutschen kennen, und im Gegenzug wuchs die Anerkennung. Natürlich waren es deutsche Flugzeuge, aber irgendwie waren alle doch Bens Kinder, für die er sich voll verantwortlich fühlte. Auch nach Jahren war der donnernde Start oder das Triebwerkpfeifen im Landeanflug für Ben immer ein Grund in den Himmel zu schauen, um seine Starfighter zu verfolgen. 1981 entsandte Lockheed Ben noch einmal zurück zu den Skunkworks nach Palmdale. Seine Expertise wurde benötigt für ein weiteres geheimes Projekt der USAF, den späteren F-117 Nighthawk Jäger. Schweren Herzens trennte sich Ben von dem geliebten Starfighter und trug zu dem operationellen Erfolg der F-117 bei. 1987 wurde Ben McAvoy nach 31 Jahren bei Lockheed in den Ruhestand versetzt und konnte sich nun endlich wieder seinen Starfightern widmen. Als Technischer Berater, diesmal unabhängig, steuerte er mit Rat und Tat Aktivitäten, alte Starfighter wieder flugfähig zu machen, und die wenigen fliegenden Exemplare flugfähig zu halten. So wie er 1976 als Wart das Projekt von Darryl Greenamyer unterstützt hatte, mit einer privat gebauten F-104 erfolgreich den Tieffluggeschwindigkeitsrekord zu brechen, so beriet Ben nun Museen und Privatbesitzer im Umgang mit ihren Starfightern. Von 50 Jahren F-104 Starfighter hat Ben McAvoy 48 Jahre erlebt. Von daher bestand bei ihm auch nie eine Frage, daß er aktives Mitglied der einzigen Starfighter-Organisation, der Cactus Starfighter Staffel, sein würde. Wenn auch nur auf dem Rücksitz, zumindest soweit bekannt, hat Ben doch auch genügend Flugstunden gesammelt, um bei Nachflugbesprechung und an der Bar seinen Mann stehen zu können. Kelly Johnson, der den Starfighter 1953 konzipiert und konstruiert hat, hat es einmal so ausgedrückt. "Ben McAvoy kennt den F-104 Starfighter besser als ich." Dem ist nichts hinzuzufügen. Ben McAvoy starb am 14. Mai 2004. Er wurde am 12. Juni 2004 in seinem Haus von Freunden, Bekannten und der Kaktus Starfighter Staffel in einer Trauerfeier gewürdigt. Seine Asche ist am 18.Juli 2004 über Cold Lake, Kanada verstreut worden. Selbstverständlich aus einem F-104 Starfighter.